Class II comprises three catalytic isoforms (C2α, C2β, and C2γ), but, unlike Classes I and III, no regulatory proteins. Class II catalyse the production of PI(3)P from PI and PI(3,4)P2 from PIP; however, little is known about their role in immune cells. 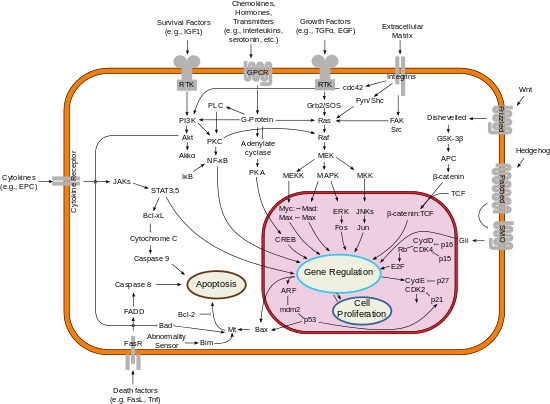 C2α and C2β are expressed through the body, but expression of C2γ is limited to hepatocytes. All PI 3-kinases are inhibited by the drugs wortmannin and LY294002, although certain members of the class II PI 3-kinase family show decreased sensitivity. ↑ PDB: 2chz​; Knight ZA, Gonzalez B, Feldman ME, Zunder ER, Goldenberg DD, Williams O, Loewith R, Stokoe D, Balla A, Toth B, Balla T, Weiss WA, Williams RL, Shokat KM (May 2006). "A pharmacological map of the PI3-K family defines a role for p110alpha in insulin signaling". Cell. 125 (4): 733–47. doi:10.1016/j.cell.2006.03.035. PMC 2946820 . PMID 16647110. ↑ Giese N (2009-03-11). "Cell pathway on overdrive prevents cancer response to dietary restriction". PhysOrg.com. Retrieved 2009-04-22. ↑ Kalaany NY, Sabatini DM (Apr 2009). "Tumours with PI3K activation are resistant to dietary restriction". Nature. 458 (7239): 725–31. doi:10.1038/nature07782. PMC 2692085 . PMID 19279572. ↑ Whitman M, Kaplan DR, Schaffhausen B, Cantley L, Roberts TM (1985). "Association of phosphatidylinositol kinase activity with polyoma middle-T competent for transformation". Nature. 315 (6016): 239–42. doi:10.1038/315239a0. PMID 2987699. ↑ Whitman M, Downes CP, Keeler M, Keller T, Cantley L (Apr 1988). "Type I phosphatidylinositol kinase makes a novel inositol phospholipid, phosphatidylinositol-3-phosphate". Nature. 332 (6165): 644–6. doi:10.1038/332644a0. PMID 2833705. ↑ Auger KR, Serunian LA, Soltoff SP, Libby P, Cantley LC (Apr 1989). "PDGF-dependent tyrosine phosphorylation stimulates production of novel polyphosphoinositides in intact cells". Cell. 57 (1): 167–75. doi:10.1016/0092-8674(89)90182-7. PMID 2467744. 1 2 3 Leevers SJ, Vanhaesebroeck B, Waterfield MD (Apr 1999). "Signalling through phosphoinositide 3-kinases: the lipids take centre stage". Current Opinion in Cell Biology. 11 (2): 219–25. doi:10.1016/S0955-0674(99)80029-5. PMID 10209156. ↑ Okkenhaug K (January 2013). "Signaling by the phosphoinositide 3-kinase family in immune cells". Annual Review of Immunology. 31 (2): 675–704. doi:10.1146/annurev-immunol-032712-095946. PMID 23330955. ↑ Carpenter CL, Duckworth BC, Auger KR, Cohen B, Schaffhausen BS, Cantley LC (Nov 1990). "Purification and characterization of phosphoinositide 3-kinase from rat liver". The Journal of Biological Chemistry. 265 (32): 19704–11. PMID 2174051. ↑ Songyang Z, Shoelson SE, Chaudhuri M, Gish G, Pawson T, Haser WG, King F, Roberts T, Ratnofsky S, Lechleider RJ (Mar 1993). "SH2 domains recognize specific phosphopeptide sequences". Cell. 72 (5): 767–78. doi:10.1016/0092-8674(93)90404-E. PMID 7680959. ↑ Yoakim M, Hou W, Songyang Z, Liu Y, Cantley L, Schaffhausen B (Sep 1994). "Genetic analysis of a phosphatidylinositol 3-kinase SH2 domain reveals determinants of specificity". Molecular and Cellular Biology. 14 (9): 5929–38. doi:10.1128/MCB.14.9.5929. PMC 359119 . PMID 8065326. ↑ Franke TF, Kaplan DR, Cantley LC, Toker A (Jan 1997). "Direct regulation of the Akt proto-oncogene product by phosphatidylinositol-3,4-bisphosphate". Science. 275 (5300): 665–8. doi:10.1126/science.275.5300.665. PMID 9005852. ↑ Gómez Del Pulgar T, De Ceballos ML, Guzmán M, Velasco G (Sep 2002). "Cannabinoids protect astrocytes from ceramide-induced apoptosis through the phosphatidylinositol 3-kinase/protein kinase B pathway". The Journal of Biological Chemistry. 277 (39): 36527–33. doi:10.1074/jbc.M205797200. PMID 12133838. 1 2 Bleeker FE, Lamba S, Zanon C, Molenaar RJ, Hulsebos TJ, Troost D, van Tilborg AA, Vandertop WP, Leenstra S, van Noorden CJ, Bardelli A (26 September 2014). "Mutational profiling of kinases in glioblastoma". BMC Cancer. 14: 718. doi:10.1186/1471-2407-14-718. PMID 25256166. ↑ Bleeker FE, Molenaar RJ, Leenstra S (May 2012). "Recent advances in the molecular understanding of glioblastoma". Journal of Neuro-Oncology. 108 (1): 11–27. doi:10.1007/s11060-011-0793-0. PMC 3337398 . PMID 22270850. ↑ Man HY, Wang Q, Lu WY, Ju W, Ahmadian G, Liu L, D'Souza S, Wong TP, Taghibiglou C, Lu J, Becker LE, Pei L, Liu F, Wymann MP, MacDonald JF, Wang YT (May 2003). "Activation of PI3-kinase is required for AMPA receptor insertion during LTP of mEPSCs in cultured hippocampal neurons". Neuron. 38 (4): 611–24. doi:10.1016/S0896-6273(03)00228-9. PMID 12765612. ↑ Joyal JL, Burks DJ, Pons S, Matter WF, Vlahos CJ, White MF, Sacks DB (Nov 1997). "Calmodulin activates phosphatidylinositol 3-kinase". The Journal of Biological Chemistry. 272 (45): 28183–6. doi:10.1074/jbc.272.45.28183. PMID 9353264. ↑ Sanna PP, Cammalleri M, Berton F, Simpson C, Lutjens R, Bloom FE, Francesconi W (May 2002). "Phosphatidylinositol 3-kinase is required for the expression but not for the induction or the maintenance of long-term potentiation in the hippocampal CA1 region". The Journal of Neuroscience. 22 (9): 3359–65. PMID 11978812. ↑ Karpova A, Sanna PP, Behnisch T (Feb 2006). "Involvement of multiple phosphatidylinositol 3-kinase-dependent pathways in the persistence of late-phase long term potentiation expression". Neuroscience. 137 (3): 833–41. doi:10.1016/j.neuroscience.2005.10.012. PMID 16326012. ↑ Opazo P, Watabe AM, Grant SG, O'Dell TJ (May 2003). "Phosphatidylinositol 3-kinase regulates the induction of long-term potentiation through extracellular signal-related kinase-independent mechanisms". The Journal of Neuroscience. 23 (9): 3679–88. PMID 12736339. 1 2 Yang PC, Yang CH, Huang CC, Hsu KS (Feb 2008). "Phosphatidylinositol 3-kinase activation is required for stress protocol-induced modification of hippocampal synaptic plasticity". The Journal of Biological Chemistry. 283 (5): 2631–43. doi:10.1074/jbc.M706954200. PMID 18057005. ↑ Peineau S, Taghibiglou C, Bradley C, Wong TP, Liu L, Lu J, Lo E, Wu D, Saule E, Bouschet T, Matthews P, Isaac JT, Bortolotto ZA, Wang YT, Collingridge GL (Mar 2007). "LTP inhibits LTD in the hippocampus via regulation of GSK3beta". Neuron. 53 (5): 703–17. doi:10.1016/j.neuron.2007.01.029. PMID 17329210. ↑ Toker A, Cantley LC (Jun 1997). "Signalling through the lipid products of phosphoinositide-3-OH kinase". Nature. 387 (6634): 673–6. doi:10.1038/42648. PMID 9192891. ↑ Cammalleri M, Lütjens R, Berton F, King AR, Simpson C, Francesconi W, Sanna PP (Nov 2003). "Time-restricted role for dendritic activation of the mTOR-p70S6K pathway in the induction of late-phase long-term potentiation in the CA1". Proceedings of the National Academy of Sciences of the United States of America. 100 (24): 14368–73. doi:10.1073/pnas.2336098100. PMC 283598 . PMID 14623952. Vanhaesebroeck B, Leevers SJ, Ahmadi K, Timms J, Katso R, Driscoll PC, Woscholski R, Parker PJ, Waterfield MD (2001). "Synthesis and function of 3-phosphorylated inositol lipids". Annual Review of Biochemistry. 70: 535–602. doi:10.1146/annurev.biochem.70.1.535. PMID 11395417. Schild C, Wirth M, Reichert M, Schmid RM, Saur D, Schneider G (Dec 2009). "PI3K signaling maintains c-myc expression to regulate transcription of E2F1 in pancreatic cancer cells". Molecular Carcinogenesis. 48 (12): 1149–58. doi:10.1002/mc.20569. PMID 19603422. Williams R, Berndt A, Miller S, Hon WC, Zhang X (Aug 2009). 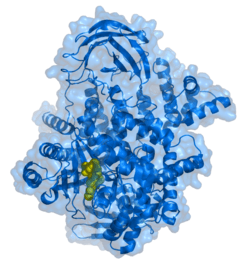 "Form and flexibility in phosphoinositide 3-kinases". Biochemical Society Transactions. 37 (Pt 4): 615–26. doi:10.1042/BST0370615. PMID 19614567. Quaresma AJ, Sievert R, Nickerson JA (Apr 2013). "Regulation of mRNA export by the PI3 kinase/AKT signal transduction pathway". Molecular Biology of the Cell. 24 (8): 1208–21. doi:10.1091/mbc.E12-06-0450. PMC 3623641 . PMID 23427269.